Why is Emigration Creek — a historic Utah waterway — dry? Blame runs from climate change to drought to development to water-sucking wells. 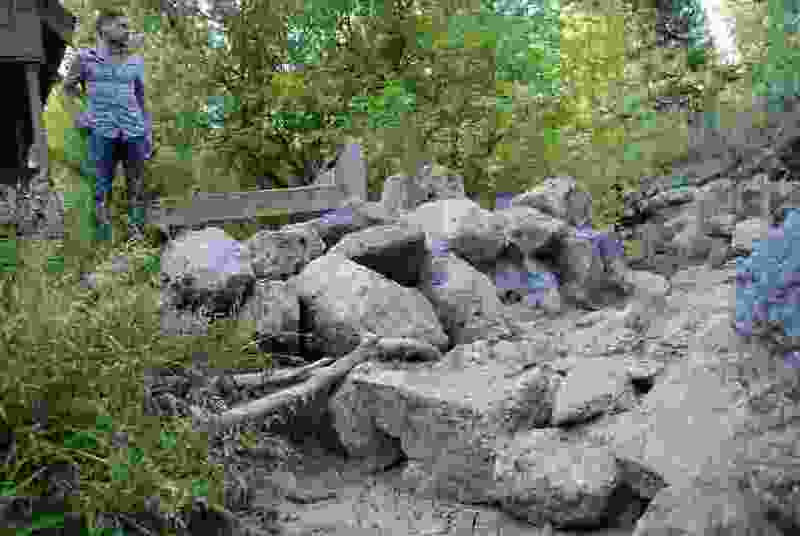 (Brian Maffly, The Salt Lake Tribune) Sam Plumb inspects the dry creek bed on his family’s property in Emigration Canyon. The creek through much of the canyon has been completely dewatered for the past two months, a sign of Utah’s worsening drought and possibly excessive groundwater pumping to feed hundreds of homes in the canyon east of Salt Lake City. The creek winding down Emigration Canyon once sustained Mormon pioneers’ inaugural crops planted in the summer of 1847 and helped water the Intermountain West’s first major settlement for decades. In some sense, Salt Lake City owes its existence to Emigration Creek, but early this summer, as persistent drought gripped northern Utah, the stream went dry for most of its run through the historic canyon. The disappearance of flows has alarmed creekside residents, who say the problem cannot be blamed entirely on a rainless summer and climate change. Plumb, whose family has owned property in the canyon bottom for decades, and many other creekside residents say flows have been in steep decline since the Emigration Improvement District (EID) sunk deep, large-bore wells. These wells pump up groundwater, filling massive tanks and largely serve newer subdivisions, such as Emigration Oaks, filled with bigger homes and fancy landscaping nestled in the hills north of the creek. (Rick Egan | The Salt Lake Tribune) Margot McCallum points out the rocks that are usually underwater year-round in Emigration Creek in front of her home in Pinecrest, in Emigration Canyon,Tuesday, Sept. 4, 2018. Many older, modest homes along the creek are still served by private wells and small water companies. These residents have long felt the district posed a threat to their water, and some have gone to court. The vanishing stream is now cited as evidence that the district’s pumping has gone too far. Back in the 1980s and ′90s, resident Michelle Andersen and her kids floated the creek in inner tubes, but flows started plunging about 15 years ago and floating is but a distant memory. This year, the stream hasn’t flowed for the past two months through a six-mile stretch below Pinecrest to the canyon month near This Is the Place Heritage Park, which commemorates Utah’s first Mormon settlement. Plumb and other residents say the improvement district’s pumping has depleted the groundwater that would otherwise recharge the creek and their wells. “That is absolutely not true,” said Joe Smolka, mayor of the newly created Emigration Township, adding this stretch of the creek is officially designated an “intermittent” stream. The district supplies culinary water to about half the canyon’s 1,600 residents, who occupy about 575 homes. In various filings with courts and state agencies, the EID has defended its practices, saying they don’t pose undue harm to other water users and that they serve a greater good, particularly by ensuring a reliable water source to fight a potential wildfire through a new network of bright red hydrants. Should the canyon burn, dozens if not hundreds of homes could be lost. The EID has monitored the groundwater for years and the data levels rise and fall with precipitation, according to Smolka. This year’s drought is notably severe after a string of dry years going back to 2000. Diminishing surface-water supplies reached a threshold that triggered an emergency statewide response mandated by state law. The Department of Natural Resources is convening a special meeting Monday to prepare a plan for addressing conditions that are taking a toll on many communities and sectors of the economy. But the EID’s critics allege heedless groundwater pumping has exacerbated Emigration’s problems. Letters have poured into the state engineer’s office seeking intervention in the EID’s primary water right, which dates to 1872 and initially appropriated surface water drawn from the canyon mouth to irrigate orchards on 159 acres at what is now Hogle Zoo. It also provided water for 17 homes and 226 head of cattle. Critics argue the district forfeited this 1872 priority date when it moved its diversion point to pull groundwater farther up-canyon from spots that could interfere with established, albeit junior, uses. In other words, the district’s water right should move from the front of the line to the back. In a federal court case, resident Mark Tracy has submitted documents and hydrology reports that show experts had concluded years ago that there is insufficient groundwater in the canyon to support large-scale water withdrawals. These documents show the canyon’s groundwater and stream flows are deeply interconnected. A 2000 study concluded the canyon could supply water for up to 700 homes, while leaving a minimum flow of 1.6 cubic feet per second in the creek. During the next 14 years, however, average August stream flows fell below that minimum eight times, even though there are far fewer than 700 homes pulling water, according to a report commissioned by Tracy’s attorneys. His suit contends the district obtained federal funding for its water projects under fraudulent pretenses. Those subsidized projects are now allegedly doing irreparable harm to the canyon, and Tracy contends the harm is manifesting as an increasingly dry stream channel and murky water discharging from shallow wells. Plumb recalls a time in his childhood when his late father, the revered angler Jack Plumb, would set up a pool in their yard to hold trout that had been stranded in stream ponds during periods of low water. “This was my old man’s idea. It worked because it was brief periods of time even in a really rough summer, but this type of dryness, there is nothing,” he said. Now there are no trout to rescue, and Plumb wonders if the weedy channel behind his and his parents’ homes is what normal looks like.